CETO is a patented wave power technology designed to convert wave energy into electricity which can be used to power an onshore desalination plant to obtain zero-emission freshwater. Instead of generating electricity offshore which then has to be transmitted at high voltage to the shore, the CETO system instead pumps large volumes of sea water directly to shore at high pressure. Some of this seawater is used to turn an electricity generating pelton-type hydro turbine while the rest can be desalinated and converted into drinkable freshwater. Since high pressure seawater is produced directly, SeaPower Pacific Pty Ltd believe this could become the world’s first zero-emission desalination technology. Any excess electricity generated can be transmitted to the national grid network. 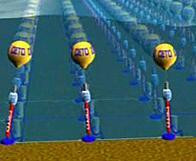 The technology behind CETO is relatively simple. 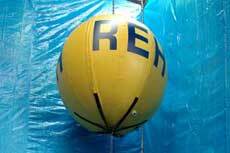 Air filled bladders made from ultra-durable hypalon are fixed on top of underwater pistons which move inside small diameter pipes fixed to the seabed. As the sea ebbs and flows, the piston is pulled up and down by the bladder producing pumping forces to drive seawater to shore via an undersea pipe. The component parts of CETO are relativly cheap and simple to manufacture, and existing technology can be used to install everything on the seabed. Existing knowledge indicates that the components (primarily steel, rubber, and hypalon) have a sub-sea life of over 30 years. CETO I was tested off the coast of Fremantle, Australia during 2005-6 and proved itself very capable. An updated and improved commercial version (CETO II) will be able to produce enough freshwater for up to 3,000 people while simultaneously supplying electricity to around 40 people. When not used for desalination, the total electicity power output of CETO II is projected to be 92kW – enough for around 100 people. 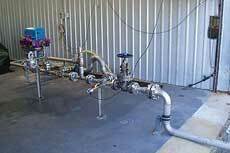 A pre-commercial prototype array of CETO II units (prototype CETO II pump pictured above) will be installed and tested during 2007-8 again at Fremantle. 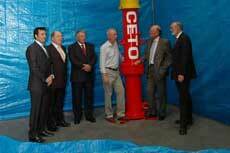 The first proposed commercial application for CETO is for a 45 Gigalitre per year desalination plant for Perth, Australia – thought of by many as the world’s most remote city. In around 2009-10 an undersea area approximately 2km by 60m will be filled with 225 CETO III water pumping units at a distance of 8km from the shore. The main advantage of CETO is cost – mass production of the simple bladder/piston/tube assemblies will drive costs down, and because CETO units do not resist the waves (they instead move with the waves), there is no need for expensive and environmentally damaging subsea concrete structures or foundations. Being installed at depths of around 20-50 metres, the CETO units are invisible from the surface, actually attract marine life, and do not affect the all important Australian surf. Another major plus point is that the ratio of electricity used for desalination compared to that distributed to the grid can be quickly varied from 0% to 100%. Therefore desalination can take place during periods of slack demand, and electricity can be distributed when it is needed the most – during periods of peak demand. To find out more about CETO, click here to visit the official CETO Wave Energy website.